OCEAN BEACH. 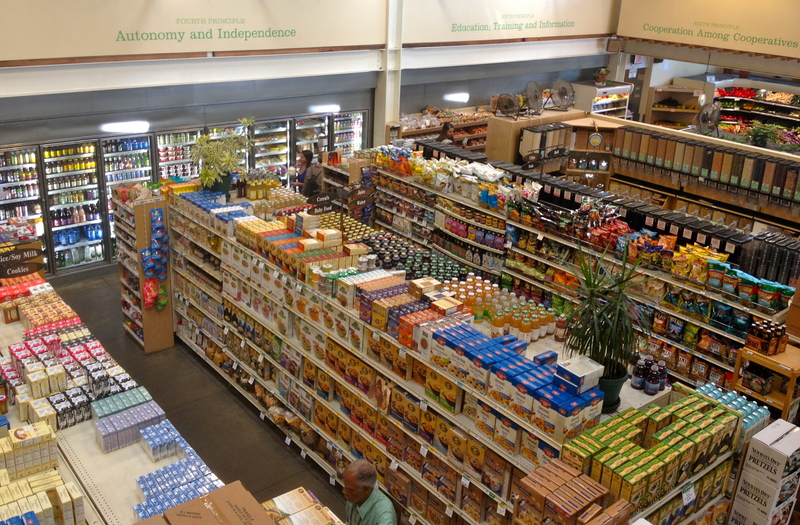 Since 1972, People’s Co-Op has been ground zero for vegans. 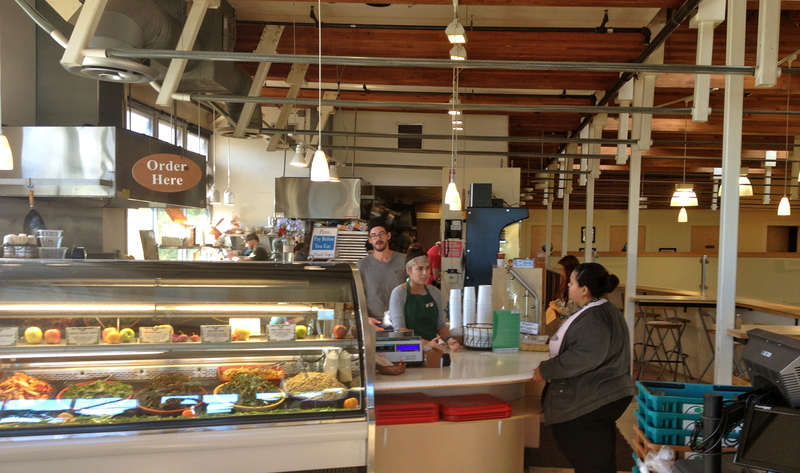 It is a 6,000 square foot, member-owned vegetarian co-op (anyone can join!) in Ocean Beach. How important is People’s to me? I live in Ocean Beach, because I want to be able to walk to there. It makes being vegan easy. It makes being vegan fun. I have wanted to write a review of People’s Co-Op for a long time. The post has been slow in coming, because the task of highlighting all of People’s great features is daunting. So my People’s posts will be done in separate parts – and this particular post will focus on breakfast. People’s exists on two levels. The first floor is a vegetarian grocery store, and the upstairs offers prepared food – strictly vegan! Again, ALL of the food on the second level is vegan! People’s provides ingredient lists for all of its dishes, but folks wary of hidden dairy and eggs can relax and order without worry. And the variety is abundant. There are always two home made soups, an extensive “do it yourself” salad bar, a cold case of specialty salads (usually between four and eight options), the hot dishes (yum! ), a bakery case (double yum! ), and an additional cold case of packaged “to go” items, drinks, and tempting desserts. Choose a plate for here, or take anything to go. Keep it simple with rice, beans, and broccoli for .99 per pound, or treat yourself to the main fare for .29 per pound. You can order as much, or as little, as your heart desires. Oh, and the friendly folks behind the counter are incredibly knowledgeable and quick to offer a sample of whatever catches your eye. At 8:00 a.m, every day, the doors open to a piping hot breakfast. 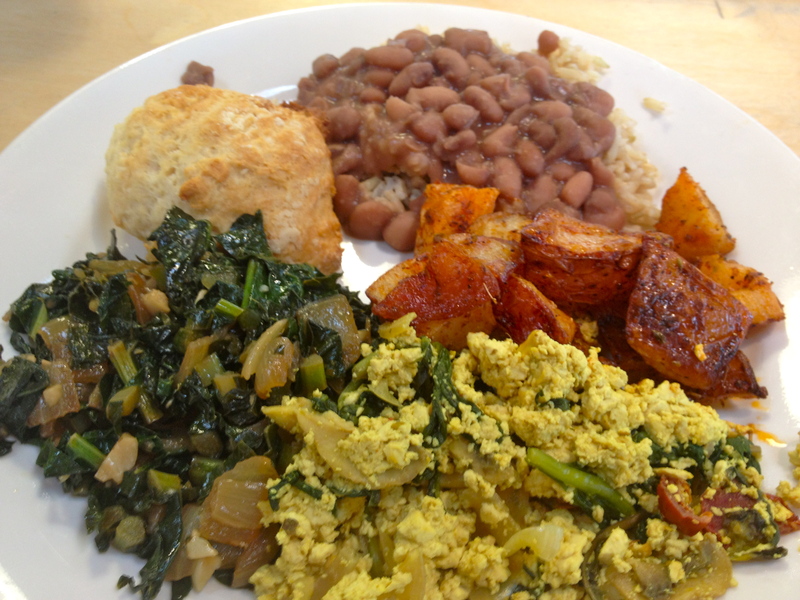 The options are fairly consistent: there is usually (1) a tofu scramble, (2) potatoes, (3) sautéed greens, (4) biscuits and gravy, (5) rice, (6) beans, and (7) breakfast sandwiches. Each option is excellent and beloved by the members. The tofu scramble has subtle changes day-to-day (I love it when they put in sun dried tomatoes), but the seasoning is always perfect. The potatoes come out of the oven crispy. And believe it or not, the greens tend to disappear most quickly. A popular version – called “Steve’s Greens” (pictured on my plate) – is a sauté of kale, garlic, onion, sunflower oil, and ume vinegar. I could eat a whole plate full of these greens. They are an easy way to get in a serving of veggies (or three) before lunch! For vegans who miss comfort food, People’s offers their biscuits and gravy. How can they make soft and fluffy biscuits without milk or butter? Because the second floor is a vegan think tank. These folks constantly brainstorm new ideas and experiment when the mood moves them. For example, I walked in one morning to find (and devour) what might have been the best french toast of my life. And why was it there? Because, according to one inside source, “somebody felt like making it that day.” This is the opposite of bureaucracy – this is a nimble organization driven by real people who want to offer healthy, creative food. And at the same time, unsurprisingly, People’s knows how to do the basics well. The brown rice is short grain perfection, and the beans (alternating between pinto and black) are firm, simple, and flavorful. Standing alone, they are a great. And paired with the other entrees, they provide a powerful foundation for a filling meal. 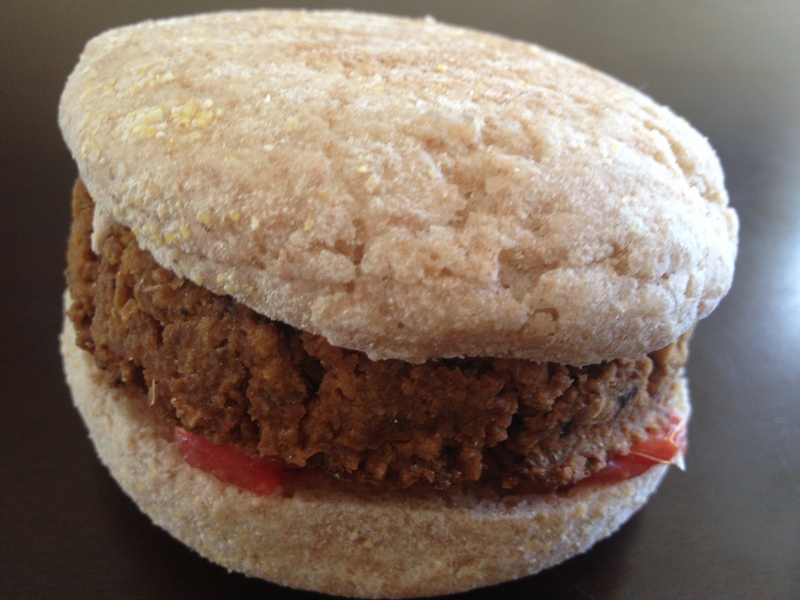 Finally, People’s has created its own Breakfast Sandwich made up from spelt English muffins, tempeh sausage, vegenaise, and tomato. The tempeh sausage is spicy and hearty. The vegenaise provides a rich flavor, and the tomato provides the token produce that makes us feel better about eating the sandwich! If you arrive at People’s hungry and are looking for something easy to eat on the go, the Breakfast Sandwich is a great choice. You never know what vegan treasures you will find in the bakery section. This morning, for example, People’s was featuring (1) Raspberry Chocolate Chip Scones, (2) Blueberry Muffins, and (3) Agave Raspberry Muffins. 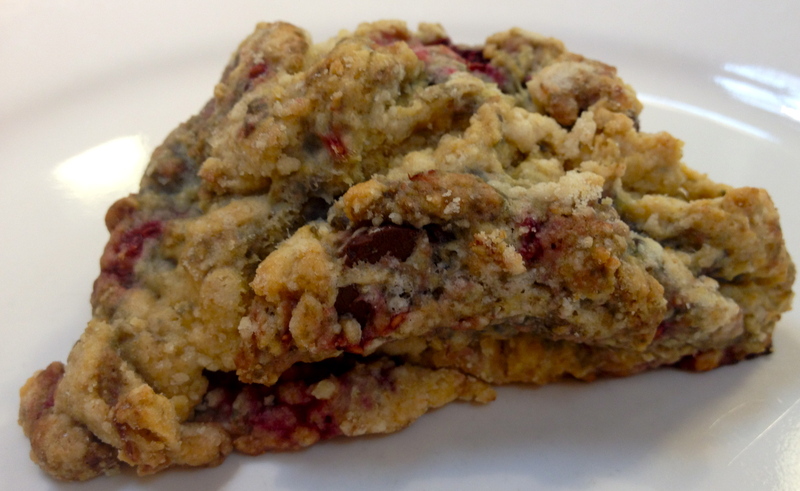 The Raspberry Chocolate Chip Scones evoked my lust for chocolate and did not disappoint – I especially enjoyed where the soft raspberry flavor connected with the pockets of rich dark chocolate. 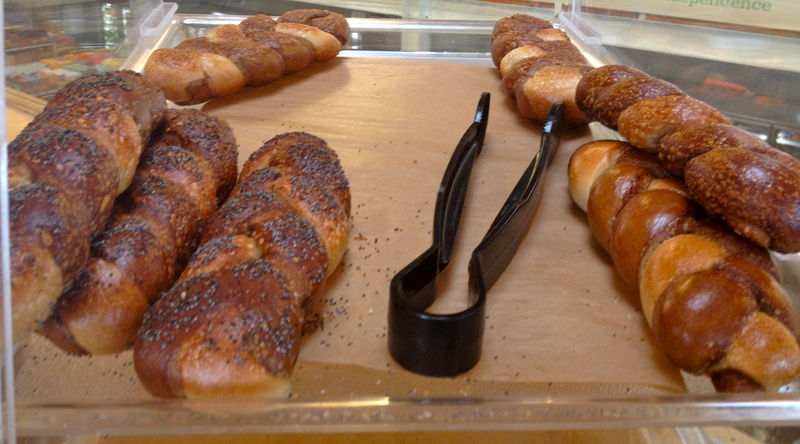 People’s also provides bagels twists from Point Loma Bagels that are free from egg and egg wash. I confess I have never tried a bagel twist (I am far too devoted to the other breakfast options), but I have noticed that they fly off the shelves. Finally, how could breakfast be complete without coffee or tea? People’s has set up a self serve station for both! There are usually 3 coffees brews, one of which is decaf. 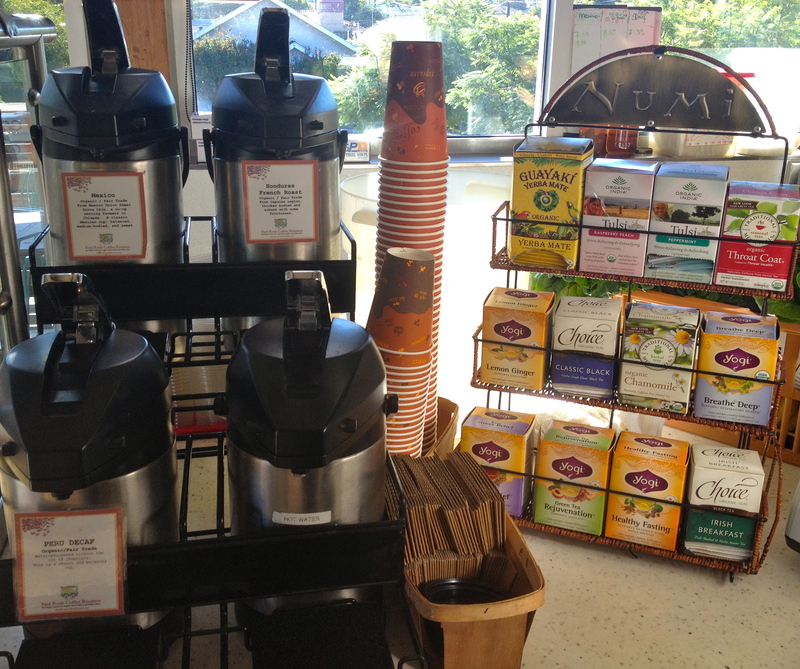 The tea rack is stocked with 12 different types of teas ranging from Yerba Mate to Lemon Ginger. Need to add something to your drink? No problem. There is non-dairy creamer, sugar, and agave for your morning beverages. My review of People’s could not possibly be complete if I didn’t mention the employees. Quite simply, People’s people are the best. They genuinely seem to enjoy the job, support the mission, and know the members. Their smiles, suggestions, and positive attitudes ensure that every experience at People’s is a bright point in my day.